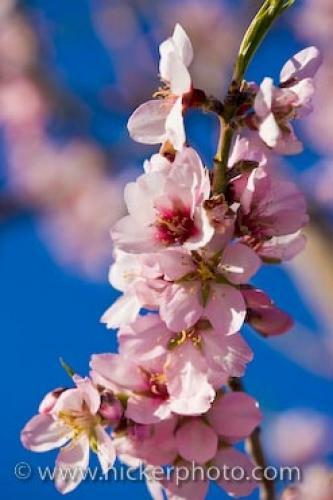 Small pink flowers blossom on an Almond tree near the town of Tarbena along the Costa Blanca in the Province of Alicante in Comunidad Valenciana, Spain. The landscape near the town of Tarbena along the Costa Blanca in the Province of Alicante, Spain, an Almond tree shows off its beautiful pink flowers. Before the almond appears, the flowers will blossom to their fullest and then slowly wilt away and die.Almond tree blossoms near the town of Tarbena, Serra de Aixorta, Costa Blanca, Province of Alicante, Comunidad Valenciana, Spain, Europe. Please also check out my photo gallery of flower pictures. near a town along the Costa Blanca in Spain.